Iron deficiency anaemia (IDA) occurs in 2–5% of adult men and postmenopausal women in the developed world and is a common cause of referral to gastroenterologists. Gastrointestinal (GI) blood loss from colonic cancer or gastric cancer, and malabsorption in coeliac disease are the most important causes that need to be sought. The lower limit of the normal range for the laboratory performing the test should be used to define anaemia (B). Any level of anaemia should be investigated in the presence of iron deficiency (B). The lower the haemoglobin the more likely there is to be serious underlying pathology and the more urgent is the need for investigation (B). Red cell indices provide a sensitive indication of iron deficiency in the absence of chronic disease or haemoglobinopathy (A). Haemoglobin electrophoresis is recommended when microcytosis and hypochromia are present in patients of appropriate ethnic background to prevent unnecessary GI investigation (C). Serum ferritin is the most powerful test for iron deficiency (A). Upper and lower GI investigations should be considered in all postmenopausal female and all male patients where IDA has been confirmed unless there is a history of significant overt non-GI blood loss (A). All patients should be screened for coeliac disease (B). If oesophagogastroduodenoscopy (OGD) is performed as the initial GI investigation, only the presence of advanced gastric cancer or coeliac disease should deter lower GI investigation (B). In patients aged >50 or with marked anaemia or a significant family history of colorectal carcinoma, lower GI investigation should still be considered even if coeliac disease is found (B). Colonoscopy has advantages over CT colography for investigation of the lower GI tract in IDA, but either is acceptable (B). Either is preferable to barium enema, which is useful if they are not available. Further direct visualisation of the small bowel is not necessary unless there are symptoms suggestive of small bowel disease, or if the haemoglobin cannot be restored or maintained with iron therapy (B). In patients with recurrent IDA and normal OGD and colonoscopy results, Helicobacter pylori should be eradicated if present. (C). Faecal occult blood testing is of no benefit in the investigation of IDA (B). All premenopausal women with IDA should be screened for coeliac disease, but other upper and lower GI investigation should be reserved for those aged 50 years or older, those with symptoms suggesting gastrointestinal disease, and those with a strong family history of colorectal cancer (B). Upper and lower GI investigation of IDA in post-gastrectomy patients is recommended in those over 50 years of age (B). In patients with iron deficiency without anaemia, endoscopic investigation rarely detects malignancy. Such investigation should be considered in patients aged >50 after discussing the risk and potential benefit with them (C). Only postmenopausal women and men aged >50 years should have GI investigation of iron deficiency without anaemia (C). Rectal examination is seldom contributory, and, in the absence of symptoms such as rectal bleeding and tenesmus, may be postponed until colonoscopy. Urine testing for blood is important in the examination of patients with IDA (B). All patients should have iron supplementation both to correct anaemia and replenish body stores (B). Parenteral iron can be used when oral preparations are not tolerated (C). Blood transfusions should be reserved for patients with or at risk of cardiovascular instability due to the degree of their anaemia (C). These guidelines are primarily intended for Western gastroenterologists and gastrointestinal (GI) surgeons, but are applicable for other doctors seeing patients with iron deficiency anaemia (IDA). They are not designed to cover patients with overt blood loss or those who present with GI symptoms. GI symptoms or patients at particular risk of GI disease should be investigated on their own merits. IDA occurs in 2–5% of adult men and postmenopausal women in the developed world1 2 and is a common cause of referral to gastroenterologists (4–13% of referrals).3 While menstrual blood loss is the most common cause of IDA in premenopausal women, blood loss from the GI tract is the most common cause in adult men and postmenopausal women.4–9 Asymptomatic colonic and gastric carcinoma may present with IDA, and seeking these conditions is a priority in patients with IDA. Malabsorption (most commonly from coeliac disease in the UK), poor dietary intake, blood donation, gastrectomy and use of non-steroidal anti-inflammatory drugs (NSAIDs) are common causes of IDA, and there are many other possible causes (table 1). IDA is often multifactorial. Its management is often suboptimal, with most patients being incompletely investigated or not investigated at all.10 11 Dual pathology—that is, the presence of a significant cause of bleeding in both upper and lower GI tracts—may occur in 1–10% of patients or more4–9 and should be increasingly considered the older the patient. The World Health Organization defines anaemia as a haemoglobin (Hb) concentration below 13 g/dl in men over 15 years of age, below 12 g/dl in non-pregnant women over 15 years of age, and below 11 g/dl in pregnant women.1 The diagnostic criteria for anaemia in IDA vary between published studies.4–9 The normal range for Hb also varies between different populations in the UK. Therefore it is reasonable to use the lower limit of the normal range for the laboratory performing the test to define anaemia (B). There is little consensus as to the level of anaemia that requires investigation. The NHS National Institute for Health and Clinical Excellence referral guidelines for suspected lower GI cancer suggest that only patients with Hb concentration <11 g/dl in men or <10 g/dl in non-menstruating women be referred.12 It has been suggested that these cut-off values miss patients with colorectal cancer, especially men.13 It is therefore recommended that any level of anaemia should be investigated in the presence of iron deficiency. Furthermore, it is recommended13 that men with Hb concentration <12 g/dl and postmenopausal women with Hb concentration <10 g/dl should be investigated more urgently, since lower levels of Hb suggest more serious disease (A). Modern automated cell counters provide measurements of the changes in red cells that accompany iron deficiency: reduced mean cell Hb (MCH)—hypochromia—and increased percentage of hypochromic red cells and reduced mean cell volume (MCV)—microcytosis.14 The MCH is probably the more reliable because it is less influenced by the counting machine used and by storage. Both microcytosis and hypochromia are sensitive indicators of iron deficiency in the absence of chronic disease or coexistent vitamin B12 or folate deficiency.15 An increased red cell distribution width will often indicate coexistent vitamin B12 or folate deficiency. Microcytosis and hypochromia are also present in many haemoglobinopathies (such as thalassaemia, when the MCV is often out of proportion to the level of anaemia compared with iron deficiency), in sideroblastic anaemia and in some cases of anaemia of chronic disease. Hb electrophoresis is recommended when microcytosis is present in patients of appropriate ethnic background to prevent unnecessary GI investigation (C). Further tests to confirm iron deficiency are occasionally necessary. Estimation of iron concentration in bone marrow by the histochemical method14 may distinguish between ‘true’ iron deficiency and other chronic disorders in which there is impaired release of iron from cells of the monocyte–macrophage system (previously known as reticuloendothelial cells), but is subjective and seldom performed. A therapeutic trial of oral iron for 3 weeks is less invasive and may aid diagnosis, but depends on compliance. A trial of parenteral iron may be more reliable, and a significant change in MCH should occur within 7 days when there is IDA. ‘Functional iron deficiency’ occurs where there is an inadequate iron supply to the bone marrow in the presence of storage iron in cells of the monocyte–macrophage system. Perhaps the most important clinical setting for this is in patients with renal failure who require parenteral iron therapy to respond to administered erythropoietin to correct anaemia. Functional iron deficiency also occurs in many chronic inflammatory diseases (eg, rheumatoid arthritis and inflammatory bowel disease)—the anaemia of chronic disease. Borderline iron-deficient diets are common, and a dietary history should be taken to identify poor iron intake. The use of aspirin and non-aspirin NSAIDs should be noted, and these drugs stopped where the clinical indication is weak or other choices are available. Family history of IDA (which may indicate inherited disorders of iron absorption23), haematological disorders (eg, thalassaemia), telangiectasia and bleeding disorders should be sought. A history of blood donation or any other source of blood loss should be obtained. The presence of one or more of these factors in the history should not, however, usually deter further investigation. A significant family history of colorectal carcinoma should be sought—that is, one affected first-degree relative <50 years old or two affected first-degree relatives. A previous history of IDA may alter the order or appropriateness of tests, especially if longstanding. Examination usually contributes little but may reveal a relevant abdominal mass or cutaneous signs of rare causes of GI blood loss (eg, Peutz–Jeghers syndrome and hereditary haemorrhagic telangiectasia). Rectal examination is seldom contributory in patients with IDA, and, in the absence of symptoms such as rectal bleeding and tenesmus, may be postponed until colonoscopy unless there is likely to be significant delay. Urine testing for blood is recommended in all patients with IDA (B), as ∼1% of patients with IDA will have renal tract malignancy.9 Anaemia occurs in approximately one-third of patients with renal cell carcinoma,24 and this is due to haematuria and haemosiderin deposition in the tumour. Further renal tract evaluation with ultrasound is recommended if haematuria is found, followed by intravenous urography and/or CT scan as necessary. Upper and lower GI investigations should be considered in all postmenopausal female and all male patients where IDA has been confirmed unless there is a history of significant overt non-GI blood loss. In the absence of suggestive symptoms (which are unreliable), the order of investigations is determined by local availability, although all patients should be screened for coeliac disease with serology (B)—see below. If oesophagogastroduodenoscopy (OGD) is performed as the initial GI investigation, only the presence of gastric cancer or coeliac disease, as explained below, should deter lower GI investigation (B). In particular, the presence of oesophagitis, erosions and peptic ulcer disease should not be accepted as the cause of IDA until lower GI investigations have been carried out. Small-bowel biopsy samples should be taken at OGD if coeliac serology was positive or not performed. Colonoscopy has the following advantages over radiology: it allows biopsy of lesions, treatment of adenomas, and identification of superficial pathology such as angiodysplasia and NSAID damage. Performing gastroscopy and colonoscopy at the same session speeds investigation and saves time for both the hospital and the patient, because only one attendance for endoscopy is required. Radiographic imaging is a sufficient alternative where colonoscopy is contraindicated. The sensitivity of CT colography for lesions >10 mm in size is over 90%.25 Barium enema is less reliable, but is still useful26 if colonoscopy or CT colography are not readily available. Ideally coeliac serology—tissue transglutaminase (tTG) antibody 27 or endomysial antibody if tTG antibody testing is not available—should be undertaken at presentation, but if this has not been carried out or if the result is not available, duodenal biopsy specimens should be taken. 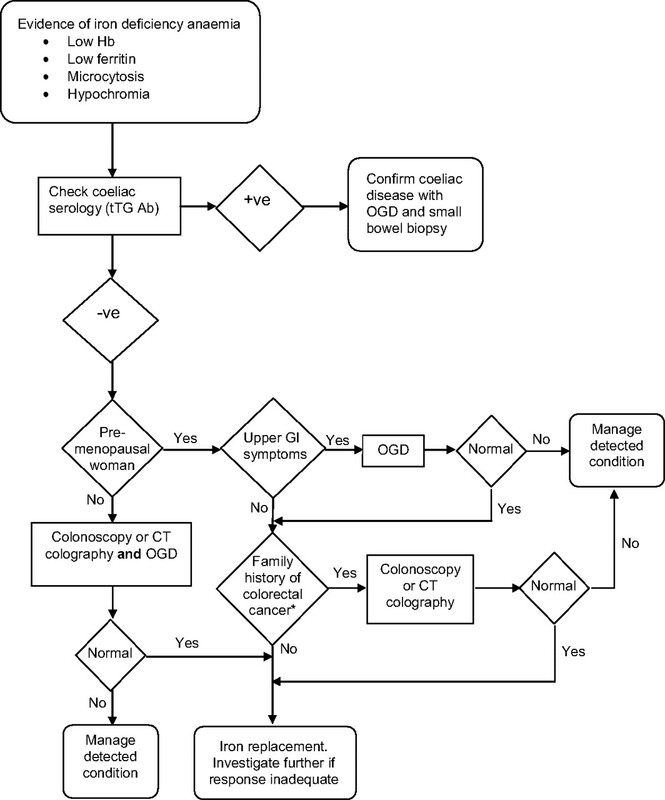 If coeliac serology is negative, small-bowel biopsies need not be performed at OGD unless there are other features, such as diarrhoea, which make coeliac disease more likely (B). The pretest probability of coeliac disease in those with IDA alone is ∼5%. The negative likelihood ratio for the tTG antibody test using human recombinant tTG is 0.06.27 Thus, if the tTG antibody test is negative, the post-test probability of coeliac disease is 0.3%, which is less than in the general population. This means that duodenal biopsy samples will need to be taken from ∼330 tTG antibody-negative patients to detect one extra patient with coeliac disease at an estimated additional cost of £35 000. If coeliac serology is positive, coeliac disease is likely and should be confirmed by small-bowel biopsy. Although concurrent testing for IgA deficiency, which is found in 2% of patients with coeliac disease, has been recommended, we do not consider it necessary to test for it routinely, because it only results in the post-test probability of coeliac disease with a negative tTG antibody test changing slightly from 0.3% to 0.2%, which is not clinically significant. However, it is advised28 if low absorbance readings are shown in the IgA tTG antibody assay. Further GI investigations are not usually necessary if coeliac disease is diagnosed. However, the lifetime risk of GI malignancy in patients with coeliac disease is slightly increased,29 particularly within 1 year of diagnosis, so investigation with colonoscopy should be considered if additional risk is present—for example, if age is >50 years or if there is a significant family history of colorectal carcinoma. If IDA develops in a patient with treated coeliac disease, upper and lower GI investigation is recommended in those aged >50 in the absence of another obvious cause. In the rare case of normal small-bowel histology with positive serology, we recommend that investigation should proceed as if coeliac serology was negative. Further imaging of the small bowel is probably not necessary unless there is an inadequate response to iron therapy, especially if transfusion dependent (B).3 7 Follow-up studies have shown this approach to be reasonably safe26 30 31 provided that dietary deficiency is corrected, NSAIDs have been stopped, and the Hb concentration is monitored. In those with an inadequate response, video capsule endoscopy or enteroscopy may be helpful to detect angiodysplasia, Crohn's disease and small-bowel neoplasia.32 33 Video capsule endoscopy has a diagnostic yield of 40–55%32–34 in this setting. However, it seldom results in a beneficial subsequent intervention.35 Many lesions detected by both enteroscopy and video capsule endoscopy are within the reach of a gastroscope, and repeat OGD should be considered before these procedures. Bleeding lesions identified by video capsule endoscopy may be amenable to treatment by push or double-balloon enteroscopy. However, the benefits of these procedures after a normal video capsule endoscopy in the context of IDA are unproven. Small-bowel imaging (MRI enteroclysis, CT enterography or barium studies) should also be considered in patients with symptoms suggestive of small-bowel disease, transfusion-dependent IDA, and rapid recurrence of anaemia after normalisation of Hb concentrations. However, many small intestinal lesions that cause asymptomatic anaemia are mucosal and flat or nearly so and most small intestinal imaging modalities apart from video capsule endoscopy are only efficient at identifying mass lesions. CT has the additional advantage of being able to identify extraintestinal pathology such as renal tumours and lymphomas. Helicobacter pylori colonisation may impair iron uptake and increase iron loss, potentially leading to iron deficiency and IDA.36–39 Eradication of H pylori appears to reverse anaemia in anecdotal reports and small studies.40 H pylori should be sought by non-invasive testing, if IDA persists or recurs after a normal OGD and colonoscopy, and eradicated if present (C). H pylori urease (CLO) testing of biopsy specimens taken at the initial gastroscopy is an alternative approach. Autoimmune gastritis has been identified as a potential cause of IDA in up to a quarter of cases,41 42 but, although of interest, its diagnosis is currently of little practical value. Giardia lamblia has occasionally been found during the investigation of IDA. If there is associated diarrhoea, then small-bowel biopsy samples will be taken anyway and may detect this. Where giardiasis is suspected, stool should be sent for ELISA, even if histology of duodenal biopsy samples is negative. Radiological imaging of the mesenteric vessels is of limited use but may be of value in transfusion-dependent IDA for demonstrating vascular malformations or other occult lesions. Similarly, diagnostic laparotomy with on-table enteroscopy is rarely required in cases that have defied diagnosis by other investigations. There is no evidence to recommend labelled red cell imaging or Meckel's scans in patients with IDA. After attending to any discovered underlying cause, the aim of treatment should be to restore Hb concentrations and red cell indices to normal, and replenish iron stores. If this cannot be achieved, consideration should be given to further evaluation. Treatment of an underlying cause should prevent further iron loss, but all patients should have iron supplementation both to correct anaemia and replenish body stores (B).45 This is achieved most simply and cheaply with ferrous sulphate 200 mg twice daily. Lower doses may be as effective and better tolerated46 47 and should be considered in patients not tolerating traditional doses. Other iron compounds (eg, ferrous fumarate, ferrous gluconate) or formulations (iron suspensions) may also be tolerated better than ferrous sulphate. Oral iron should be continued for 3 months after the iron deficiency has been corrected so that stores are replenished. Ascorbic acid (250–500 mg twice daily with the iron preparation) may enhance iron absorption,48 but there are no data for its effectiveness in the treatment of IDA. For those intolerant or not responding to oral iron, there are three parenteral preparations available, two of which can only be administered intravenously (iron sucrose (Venofer) and ferric carboxymaltose (Ferinject)), and one that can be given either intravenously or by deep gluteal intramuscular injection (iron (III) hydroxide dextran (Cosmofer)), although this can be painful and requires several injections. A comparison of intravenous iron compounds is shown in table 2. The principal advantage of ferric carboxymaltose, a recent addition to intravenous therapy, is the abbreviated duration of infusion, without the need for a test dose—15 min compared with 6 h with Cosmofer (consisting of a 15 min test dose, 45 min observation, 4 h infusion, then 1 h observation). Although drug costs are higher, length of stay in a day-case or primary-care facility is reduced. Blood transfusions should be reserved for patients with symptomatic anaemia despite iron therapy or at risk of cardiovascular instability because of their degree of anaemia (C), particularly if they are due to have endoscopic investigations before a response from iron treatment is expected.54 Transfusions should aim to restore Hb to a safe level, but not necessarily normal values. Iron treatment should follow transfusion to replenish stores. An abbreviated investigation flow chart is shown in figure 1 and an abbreviated treatment flow chart in figure 2. They both should be used in conjunction with the text. 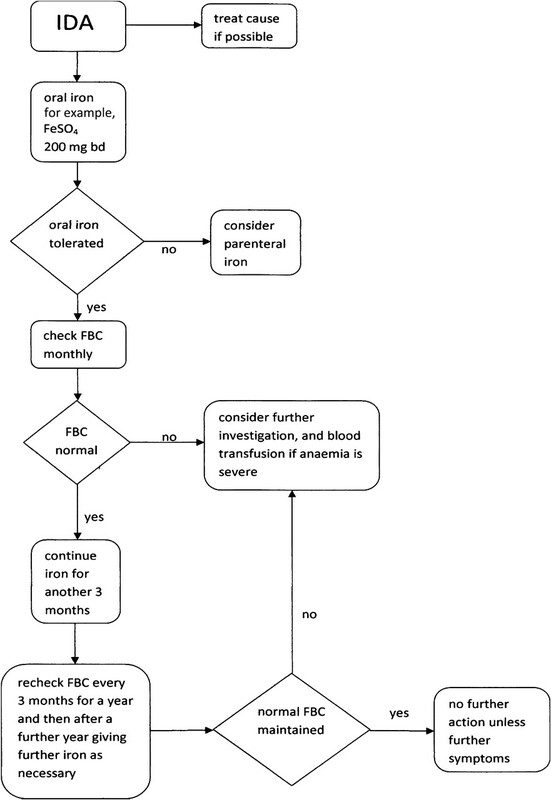 An abbreviated flow chart of the investigation of iron deficiency anaemia. GI, gastrointestinal; Hb, haemoglobin; OGD, oesophagogastroduodenoscopy; tTG Ab, tissue transglutaminase antibody. *See text for details of significant family history. An abbreviated flow chart of the treatment of iron deficiency anaemia (IDA). bd, twice a day; FBC, full blood count. IDA occurs in 5–12% of otherwise healthy premenopausal women55 56 and is usually due to menstrual loss, increased demands in pregnancy and breast feeding, or dietary deficiency.57 The yield of GI investigation in these ‘patients’ has been investigated in several studies.58–66 Malignant tumours have been found in 0–6.5% of patients, but the two studies64–66 with highest detection rates have been criticised as non-representative. It therefore seems likely that, although malignant tumours may occur in asymptomatic premenopausal women, they are extremely uncommon. Coeliac disease is present in up to 4% of premenopausal women in these studies. All premenopausal women with IDA should be screened for coeliac disease (B). Age is the strongest predictor of pathology in patients with IDA,9 and thus GI investigation as outlined above is recommended for asymptomatic premenopausal women with IDA aged 50 years or older (B). Colonic investigation in premenopausal women aged <50 years should be reserved for those with colonic symptoms, a strong family history (two affected first-degree relatives or just one first-degree relative affected before the age of 50 years67), or persistent IDA after iron supplementation and correction of potential causes of losses (eg, menorrhagia, blood donation and poor diet). Although it is convenient to use the term premenopausal, it is menstruation that influences the investigative pathway. Thus those premenopausal women who have IDA but no menstruation (eg, after hysterectomy) should be fully investigated. The appropriateness of investigating patients with frailty and/or severe comorbidity needs to be considered on a case-by-case basis. Factors to be taken into account include the severity and recurrent nature of the anaemia, the risk of bowel preparation before lower GI investigation, and the potential fitness of the patient to withstand treatment in the event that a colorectal cause was identified. The least invasive test should be used where deemed appropriate. There are no data in the literature about the detection rate of cancer in patients with IDA being investigated with unprepared CT or minimally prepared CT compared with standard CT colography or colonoscopy. Provisional data from the national bowel cancer screening programme show a pick up rate of 6.9% for minimal or unprepared CT (101 patients) compared with 11% for colonoscopy (>33 000 patients). Thus, although unprepared CT may miss occasional cancers, we continue to recommend this for very frail patients in whom bowel preparation may be risky. An older patient with weight loss may benefit from an initial CT scan of the abdomen, pelvis and thorax, and, if malignancy is found, endoscopy may not be necessary. Prompt and effective iron replacement is needed before urgent surgery, and intravenous iron is a likely cost-effective solution that may obviate the need for blood transfusion. Although the incidence of important GI pathology in young men is low, there are no data on the yield of investigation in those with IDA. In the absence of such data, we recommend that young men should be investigated in the same manner as older men (C). Where there is an obvious cause of blood loss (eg, blood donation), it is reasonable to avoid investigations unless anaemia recurs despite correction of the cause of blood loss. Mild IDA is common in pregnancy, and iron replacement should be encouraged as soon as the diagnosis is made. A careful history and examination should be made, specifically seeking a family history of gastrointestinal neoplasia or coeliac disease. Coeliac serology should be carried out. If it is positive, endoscopy and duodenal biopsy can be performed, as there is no evidence this is unsafe in pregnancy. If there is concern about lower GI pathology, further investigation should be considered, although in some patients this may be delayed until after delivery. Performing unsedated flexible sigmoidoscopy in pregnancy is considered quite safe.68 However, there are insufficient data on the safety of performing colonoscopy in pregnancy, and, because of its potential to cause serious adverse events, it should be reserved for very strong indications.68 MR colography is believed to be safe for mother and fetus and should be preferred to radiological imaging. The National Radiological Protection Board considers it prudent to avoid MRI in the first trimester. IDA is very common in patients with partial or total gastrectomy,69 probably because of poor chelation and absorption of iron as a result of loss of ascorbic acid and hydrochloric acid, and loss of free iron in exfoliated cells. However, these patients also have a two- to three-fold increased risk of gastric cancer after 20 years, and probably an increased risk of colon cancer. Investigation of IDA in post-gastrectomy patients aged >50 years of age is therefore recommended (C). Bariatric surgery can lead to iron deficiency, but iron supplementation is usually recommended after surgery to prevent the problem. No significant difference in the prevalence of GI cancer was found in patients taking aspirin or warfarin, either alone or in combination, compared with patients not taking these drugs.9 IDA should therefore not be attributed to these drugs until GI investigations have been completed. There are no data to indicate that proton pump inhibitors cause IDA in humans. Patients taking these drugs should not be considered less likely to have malignancy. Iron deficiency without anaemia (confirmed by low serum ferritin-hypoferritinaemia) is three times as common as IDA,63 but there is no consensus on whether these patients should be investigated, and further research is needed. The largest study shows very low prevalence of GI malignancy in patients with iron deficiency alone (0.9% of postmenopausal women and men, and 0% of premenopausal women).63 Higher rates have been reported only in more selected groups.70 71 In the absence of firm evidence, we tentatively recommend coeliac serology in all these patients but that other investigation be reserved for those with higher-risk profiles (eg, age >50 years) after discussion of the risks and potential benefits of upper and lower GI investigation (C). All others should be treated empirically with oral iron replacement for 3 months and investigated if iron deficiency recurs within the next 12 months (C). All patients with IDA should be screened for coeliac disease. All patients (other than menstruating women) with IDA and no obvious cause should have both an upper GI endoscopy and either colonoscopy or radiological imaging (unless carcinoma or coeliac disease is found). All patients receive appropriate iron replacement. All those not responding to treatment should be considered for further investigation. In all patients being investigated for IDA, reasonable evidence of IDA should be documented in the notes by appropriate Hb, MCH and MCV or ferritin values, or there should be an explanation of why iron deficiency is suspected in patients not showing typical blood test results. World Health Organisation. Worldwide Prevalence of Anaemia 1993–2005. WHO, 2008.
. Prevalence of anemia in persons 65 years and older in the United States: evidence for a high rate of unexplained anaemia. Blood 2004;104:2263–8.
. Prospective survey of investigations in outpatients referred with iron deficiency anaemia. Gut 1993;34:1102–7.
. Prospective evaluation of gastrointestinal tract in patients with iron-deficiency anemia. Dig Dis Sci 1995;40:1283–9.
. Evaluation of the gastro-intestinal tract in patients with iron-deficiency anemia. N Engl J Med 1993;329:1691–5.
. Gastrointestinal investigation of iron deficiency anaemia. BMJ 1986;292:1380–2.
. A prospective study of bidirectional endoscopy (colonoscopy and upper endoscopy) in the evaluation of patients with occult gastrointestinal bleeding. Am J Gastroenterol 1992;87:62–6.
. Synchronous upper and lower gastrointestinal endoscopy is an effective method of investigating iron-deficiency anaemia. Br J Surg 1997;84:1725–8.
. Risk factors for gastrointestinal malignancy in patients with iron-deficiency anaemia. Eur J Gastroenterol Hepatol 2005;17:1197–203.
. Audit of the investigation and outcome of iron-deficiency anaemia in one health district. J R Coll Physicians Lond 1996;30:33–5.
. Iron deficiency anaemia in general practice: clinical outcomes over three years and factors influencing diagnostic investigations. Postgrad Med J 2004;80:405–10. NHS National Institute for Health and Clinical Excellence. Referral Guidelines for Suspected Cancer. Clinical Guidance 27, 2005. (http://www.nice.org.uk/CG027quickrefguide).
. The importance of anaemia in diagnosing colorectal cancer: a case-control study using electronic primary care records. Br J Cancer 2008;98:323–7.
. Dacie and Lewis Practical Haematology. 9th edn. London: Churchill Livingstone, 2001.
. Prevalence of hypochromia (without microcytosis) vs microcytosis (without hypochromia) in iron deficiency. Clin Lab Haematol 2000;22:79–80.
. Laboratory diagnosis of iron-deficiency anaemia: an overview. J Gen Intern Med 1992;7:145–53.
. Iron deficiency and the measurement of iron status. Nutr Res Rev 1992;5:189–202.
. The measurement of serum transferrin receptor. Am J Med Sci 1999;318:269–76.
. The quantitative assessment of body iron. Blood 2003;101:3359–64.
. Diagnosis of iron deficiency in chronic renal failure. Am J Kidney Dis 1999;34:508–13.
. Clinical utility of the reticulocyte hemoglobin content in the diagnosis of iron deficiency. Blood 2002;99:1489–91.
. Detection of functional iron deficiency during erythropoietin treatment: a new approach. BMJ 1992;304:225–6.
. Human transferrin G277S mutation: a risk factor for iron deficiency anaemia. Br J Haematol 2001;115:329–33.
. Microcytic hypochromic anaemia associated with renal cell carcinoma. South Med J 1984;77:635–7.
. Diagnostic accuracy of computed tomographic colonography for the detection of advanced neoplasia in individuals at increased risk of colorectal cancer. JAMA 2009;301:2453–61.
. Iron deficiency anaemia—how far to investigate? Gut 1993;34:1427–8.
. Systematic review: the use of serology to exclude or diagnose coeliac disease (a comparison of the endomysial and tissue transglutaminase antibody tests). Aliment Pharmacol Ther 2006;24:47–54.
. IgA antibodies to human tissue transglutaminase: audit of routine practice confirms high diagnostic accuracy. Scand J Gastroenterol 2004;39:1078–82.
. Malignancy and mortality in people with coeliac disease: population based cohort study. BMJ 2004;329:716–18.
. Long-term follow-up of older patients with iron-deficiency anemia after a negative GI evaluation. Am J Gastroenterol 1996;91:885–9.
. Long-term follow-up of patients with iron deficiency anaemia after a negative gastrointestinal evaluation. Eur J Gastroenterol Hepatol 2009;21:872–6.
. Diagnostic and therapeutic push type enteroscopy in clinic use. Gut 1995;37:346–52.
. Guidelines on small bowel enteroscopy and capsule endocopy in adults. Gut 2008;57:125–36.
. Outcome of patients with obscure gastrointestinal bleeding after capsule endoscopy: report of 100 consecutive cases. Gastroenterology 2004;126:643–53.
. Does capsule endoscopy improve outcomes in obscure gastrointestinal bleeding? Randomized trial versus dedicated small bowel radiography. Gastroenterology 2010;138:1673–80.
. Concomitant alterations in intragastric pH and ascorbic acid concentration in patients with Helicobacter pylori gastritis and associated iron deficiency anaemia. Gut 2003;52:496–501.
. Helicobacter pylori impairs iron absorption in infected individuals. Dig Liver Dis 2004;36:455–60.
. Serum ferritin, hemoglobin, and Helicobacter pylori infection: a seroepidemiologic survey comprising 2794 Danish adults. Gastroenterology 1998;115:268–74.
. Helicobacter pylori-associated chronic gastritis and unexplained iron deficiency anemia: a reliable association? Helicobacter 2003;8:573–7.
. Reversal of iron deficiency anemia after Helicobacter pylori eradication in patients with asymptomatic gastritis. Ann Intern Med 1999;131:668–72.
. Role of autoimmune gastritis, Helicobacter pylori and celiac disease in refractory or unexplained iron deficiency anemia. Hamatologica 2005;90:585–95.
. The clinical utility and diagnostic yield of routine gastric biopsies in the investigation of iron-deficiency anaemia: a case-control study. Am J Gastroenterol 2008;103:2883–9.
. A prospective audit of patients presenting with iron deficiency anaemia and faecal occult blood loss. Gut 1992;33(Suppl 1):S31. (abstract).
. Endoscopic evaluation of iron deficiency anemia. A guide to diagnostic strategy in older patients. Postgrad Med 1995;98:213–26.
. Prescribing iron. Prescribers' J 1997;37:82–7.
. A small dose iron tolerance test as an indicator of mild iron deficiency. JAMA 1984;251:1986–7.
. Small-dose iron absorption testing in anemic and non-anemic elderly hospitalised patients. Eur J Haematol 1997;58:99–103.
. Is there a physiological role of vitamin C in iron absorption? Ann N Y Acad Sci 1987;498:324–32.
. Safety in iron management. Am J Kidney Dis 2003;6(Suppl 5):S18–26.
. Parenteral iron therapy options. Am J Hematol 2004;76:74–8.
. Comparative efficacy and safety of intravenous ferric carboxymaltose in the treatment of postpartum iron deficiency anaemia. Int J Gynaecol Obstet 2008;101:67–73.
. A novel intravenous iron formulation for the treatment of anaemia in inflammatory bowel disease: the ferric carboxymaltose (FERRINJECT) randomized controlled trial. Am J Gastroenterol 2008;103:1182–92.
. Large dose intravenous ferric carboxymaltose injection for iron deficiency anemia in heavy uterine bleeding: a randomized controlled trial. Transfusion 2009;49:2719–28.
. British Committee for Standards in Haematology. Guidelines for the clinical use of red cell transfusions. Br J Haematol 2001;113:24–31. World Health Organisation. The Prevalence of Anaemia in Women: A Tabulation of Available Information. 2nd edn. Geneva: World Health Organisation, 1992.
. Prevalence of iron deficiency in the United States. JAMA 1997;277:973–6.
. Pregnancy and iron deficiency: unresolved issues. Nutr Rev 1997;55:91–101.
. Iron deficiency in pre-menopausal females. Ir Med J 1989;82:69–70.
. The aetiology of iron deficiency anaemia in pre-menopausal women. Gastroenterology 1994;106:A26.
. Evaluation of the gastrointestinal tract in premenopausal women with iron deficiency anaemia. Am J Med 1998;105:281–6.
. A prospective, multidisciplinary evaluation of premenopausal women with iron-deficiency anemia. Am J Gastroenterol 1999;94:109–15.
. Predictive factors of GI lesions in 241 women with iron deficiency anemia. Am J Gastroenterol 2002;97:590–3.
. Iron deficiency and gastrointestinal malignancy: a population-based cohort study. Am J Med 2002;113:276–80.
. Audit of investigations in patients with iron deficiency anaemia. Singapore Med J 2003;44:504–10.
. Endoscopic evaluation of the upper gastrointestinal tract is worthwhile in premenopausal women with iron deficiency anemia irrespective of menstrual flow. Scand J Gastroenterol 2003;38:239–45.
. Gastrointestinal endoscopy in premenopausal women with iron deficiency anemia: determination of the best diagnostic approach. Am J Gastroenterol 1997;94:1715.
. Guidelines for colorectal cancer screening in high risk groups (update from 2002). Gut 2010;59:666–90.
. Flexible sigmoidoscopy and colonoscopy during pregnancy. Gastrointest Endosc Clin N Am 2006;16:59–69.
. A gastrectomy population: 25–30 years on. Postgrad Med J 1990;66:450–6.
. Serious gastrointestinal pathology found in patients with serum ferritin values ≤50 ng/ml. Am J Gastroenterol 1998;93:772–6.
. Upper and lower gastrointestinal evaluation of elderly inpatients who are iron deficient. Am J Med 1999;107:24–9. Authors' note It is with deep sadness that we record Dr Alistair McIntyre's sudden and premature death after completing these revised guidelines. His wide knowledge and experience and his common sense contributed greatly to the success of the previous guidelines. His co-authors had great pleasure in working with him since 1999.